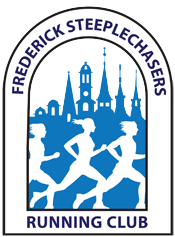 This low-key 5k race for the Frederick Steeplechasers Running Club was introduced in 2017. Why: We wanted a new race that wasn’t in Baker Park, and we thought one around Independence Day would be fun! How much: Free for Steeplechaser members, $10 for non-members. Registration at https://runsignup.com/indy5000 or on-site race morning. If you’re not a club member, you can join on race day for $20 to enjoy many other benefits throughout the year. Or better yet, join/renew online before race day. Food: Please bring your own food and beverage to share after the race. We love breakfast runs! Weather: Any announcements about possible cancellations due to weather will be made on the Frederick Steeplechasers Facebook Group. This race runs right along the scenic Moncacy River. If the river floods, the race will have to be cancelled.